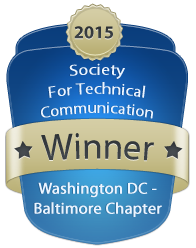 Just as we were excited to celebrate Nexight’s five-year anniversary last June, we are thrilled to announce another five-year milestone: our technical communications have again won awards from the Washington, DC – Baltimore Chapter of the Society for Technical Communication (STC) annual competition. Sound & Sensible Program Infographic, Award of Excellence – This infographic was developed as part of a communications strategy to announce the outcome of 14 one-year projects under the Sound & Sensible program, funded by the U.S. Department of Agriculture (USDA) National Organic Program (NOP) to reduce burdensome aspects of organic certification while maintaining high standards, ensuring compliance, and protecting organic integrity. PERC Energy POD Dashboard, Award of Excellence – This multi-page dashboard graphically communicates data collected and analyzed from the Propane Education & Research Council (PERC) Propane Energy POD Builder Incentive Program, which provides a financial incentive to builders who install propane-fueled appliances in new homes. The resulting infographic presents the data in a compelling way that allows PERC to tailor training and other marketing materials in a way that better prepares builders and construction professionals to serve the propane market. Advancing Thermal Manufacturing: A Technology Roadmap to 2020, Award of Merit – Developed in support of ASM International as part of the National Institute for Standards and Technology (NIST) Advanced Manufacturing Technology (AMTech) initiative, this roadmap provides the cross-sector thermal manufacturing community with an actionable plan to accelerate the development, adaptation, and implementation of advanced technologies throughout the industry in the next five years. Effective technical communications are a cornerstone of Nexight’s approach to solving complex problems. Awards like these reaffirm our commitment to crafting communications materials that use smart design and sharp technical writing to convey compelling messages that drive our target audiences to take action.